75% of the world’s largest island is covered by ice so not surprisingly, most of the action happens on the coast and a small-ship circumnavigation is undoubtedly the best way to see the highlights. This vast island has until relatively recently, remained the domain of the truly intrepid. That is all changing, however, and Greenland is becoming more accessible and gaining the acknowledgement it deserves for its awe-inspiring landscapes and cultural heritage. That doesn’t mean that tourist resorts and highways are springing up all over the place, indeed the island still has a limited infrastructure, so exploring numerous destinations can prove to be challenging. Our solution is a small-ship cruise; allowing you easy access to Greenland’s main highlights and the chance to change location without the endless unpacking and repacking. Abolish any concerns that your experience will be diminished by not staying on terra firma. You’ll have plenty of opportunities to gain a sense of the local way of life and heritage during your landing trips and you’ll simply experience a broader set of breathtaking destinations than is possible by travelling over land. Greenland offers so much. From picturesque Uummannaq in the north to Ilulissat and the world famous UNESCO world heritage site of the Ice Fjord and the Equip Glacier in the west. Greenland’s capital Nuuk, incredible Ikka Fjord, as well as towns such as Narsasuaq and Quassiarsuk, are all highlights. Greenland - More ice white than green! Greenland is the world’s most sparsely populated country and the world’s largest island. Famed for its gigantic ice cap, and every summer as the ice breaks off and crashes into the fjords, the island’s coastal waters are populated by a staggering 250 million tons of icebergs. The scale of the ice cap is almost incomprehensible as it is around 3km thick in places and covers an area the size of Mexico. Not surprisingly, it covers the majority of the island and has left only a narrow ribbon of uncovered land around the coast. Of course, this means that all of the main sights and attractions are easily accessed during a small-ship cruise. This is not a destination that sun-seekers should flock to as the mean temperature remains around 10°C even in the middle of summer but, as it has fairly low humidity, the island can feel warmer. Our cruise operates in September when temperatures will be starting to fall ahead of the onset of winter. The daylight hours remain long enough to enjoy the daytime shore excursions and the dark skies that descend at night can provide glimpses of the Northern Lights if conditions are favourable. Greenlandic society has been influenced by a blend of Inuit, Canadian and Danish cultures which is unsurprising given its location between Canada and Europe. These influences have created a rich and varied nation and a place where traditional values remain strong, despite the inevitable arrival of more modern imports. A classic place to witness this montage of cultures is on a restaurant or café menu. There may be modern dishes available but some of the ingredients can be very traditional. Seafood is a staple, but the likes of marine mammals such as seal and whale as well as reindeer, musk ox and seabirds also provide essential protein sources. 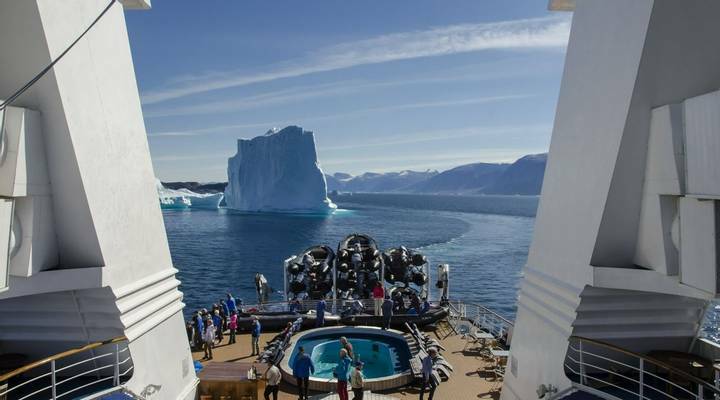 The MS Ocean Diamond is ideally equipped for taking on the Arctic waters. With capacity for only 224 passengers, this is not a large scale cruise in any way, meaning that your experiences are all the more memorable. The ship’s expedition crew are experts and will keep you well informed, and well fed, throughout. There’s no ceremony on board and so you can leave your tux at home, just make sure you have your walking boots and a good down jacket packed instead. Your holiday actually begins and ends in Iceland. You’ll start by boarding a flight to Kangerlussuaq where you will embark the ship. From here you will head along the west coast to Uummannaq where you’ll gain a real insight into life in this most northerly of locations. It is then on to Ilulissat and the world famous Icefjord which is a UNESCO world heritage site. You can choose to cruise on it or fly above it as there are many shore excursion options available here. You’ll also visit the famous Equip Glacier. Your voyage continues on to Greenland’s capital Nuuk, a veritable metropolis with a whopping 16,000 residents. This town offers some wonderful shore excursions – a food tasting tour is a real must-do (you can ask Andy our Travel Expert about some of the local delicacies he tried). After Nuuk, it’s ever onwards to your next port of call, Ikka Fjord and its mineral columns, before heading on to Narsarsuaq and Quassiarsuk where hiking, kayaking or Viking ruin exploration are all options. Your cruise then culminates in a crossing of Prince Christian Sound and The Denmark Strait as you head east to Iceland and the Westman Islands before disembarking in Reykjavik.